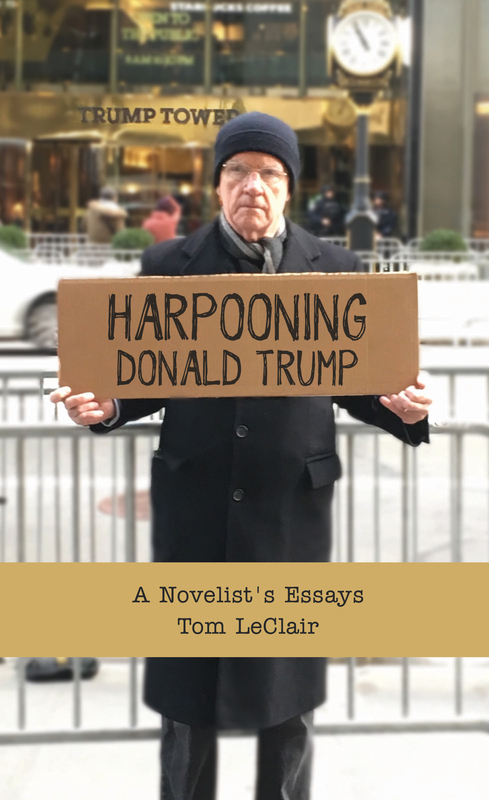 “Final Words” is a shorter version of the first essay in Tom LeClair’s Harpooning Donald Trump: A Novelist’s Essays, recently published in paperback and as an e-book by the independent press Mediacs. More information about the book can be found at tomleclair.com. Final words could be the last words in an argument, in my case about what contemporary fiction is important and should last, what fiction is trivial and transitory. The argument I made in The Art of Excess in 1989 was that our systems-minded, encyclopedic, even “excessive” novels are our best books. Those last words are impossible because I see all around me that my argument is lost. Now, to quote Eliot again, “signs are taken for wonders,” inchlings mistaken for giants such as last century’s Pynchon and Gaddis and DeLillo. I know this “age of lead” complaint is common from old men and old women, but I’ve been conducting an experiment on this matter for the last eight years, reading all the fiction finalists (and even all the long lists of ten introduced in 2013) for the National Book Award. In my judgment (and I was a judge in 2005), rarely do the most ambitious, largest-minded, profound, and ingenious books win, and quite often the few books of substance published in any given year don’t make the final five or even the long lists. You can find my “data” and conclusions by Googling my name and National Book Awards, for I have published annual reviews of the finalists the last seven years in the Barnes and Noble Review and this year in the Daily Beast. Even if I had a bully pulpit like James Wood’s or a hundred devoted epigones in LeClair’s School of Excess, nothing would change reading habits exemplified for me by Amazon’s lists of various books under two hundred pages that can be easily skimmed on a phone. David Foster Wallace is dead and so is the heroic novel such as Infinite Jest and his unfinished The Pale King. Writers will go on producing modest and minor novels to please the small literary slice of the general audience. But mastery—the monumental mode represented by Pynchon and Gaddis and Wallace—appears done, so what profits a man, except for the freelancer fees, to continue lamenting like some Ancient Mariner that monsterpieces [sic] have been supplanted by artisanal consumables, that works one remembers for decades have been replaced by works that one forgets in a week? Final words could also be a succinct summation, perhaps the name of a website. There’s a computer game company called “Failbetter.” My site would be “Faillater.” Failing as a critic, I turned to fiction late, publishing my first novel, Passing Off, when I was fifty-two. Novels that followed—Passing On and Passing Through—measured no more than an inch apiece, but I was engaged in a Rabbit project with my hoopster narrator/protagonist Michael Keever. The “Passing” sequence, at about eight hundred pages, would be my serialized Big Book, not as long or wide as Updike’s but at least an attempt to chart one working man’s progress through recent history. Now, after some other novels, I’ve written the final words of the “Passing” series, Passing Away. But since it is more insistently literary and Nabokov-tricky than the earlier novels, I doubt that Passing Away will ever see print. The first three in the sequence were published by three different small, literary presses; two are defunct, the other has survived by switching to crime novels. Twenty years ago, the biggest and best independent presses would read the manuscript of Passing Off and even comment on it. Surveying small presses now, I find they are overwhelmed by manuscripts that large publishers say they can’t sell, works such as the following prize winners: Jaimy Gordon’s Lord of Misrule (from McPherson, an NBA award) and Edith Pearlman’s Binocular Vision (from Lookout, an NBCC award). Some small presses won’t even look at non-agented manuscripts. Other presses make acceptance sound like the odds against winning the lottery, though you will have to wait a few years for your reward. With reduced support from the government and foundations, indie presses are like superannuated people struggling to survive. When I was middle-aged, I thought I could start small and write my way up and out to publication with larger presses that get their books noticed in the venues for which I was writing reviews, but just as I was trying to move up the conglomerates were cutting down on literary fiction. One encouraging fact for the young: A debut novel has a better chance of acceptance than a fourth novel by someone tainted by the small-press ghetto. So I have come to the present pass: mini-memoir, the last refuge of, if not a scoundrel, a discouraged writer. Final words could also be an epitaph, or the curtain soliloquy. In Beckett’s Endgame, the old chair-bound and story-telling Hamm says in his last speech, “Old endgame lost of old, play and lose and have done with losing.” Hamm’s last words are addressed to a handkerchief with which he covers his face: “Old stancher! You . . . remain.” The handkerchief is his curtain and the veil of words behind which he hides himself. I’ve found that words—even my main man Michael Keever’s—come slower and harder, without the same kind of excitement present in my fifties and sixties. I have no patience with cinematic description, not much patience for commercial plot. I want only the characters to speak to one another and talk about each other. Only one of the three protagonists in Passing Away does anything dramatic; terminally ill, he arranges his own murder. A phlegmatic policeman with no need of verbal summation, his last words are to his brother, who is going shopping for him: Buy “prune juice.” I guess that’s the much-remarked “late style” of minimal prose. I’m not arranging my death, but I hope to arrange a few more last words than two. Influenced by my fellow point guard Keever, I’d like my epitaph to be “He Hit The Open Man.” Updike’s Rabbit was a shooter. Michael and I were passers, assist guys, not the stars but those who helped the stars by giving them passes. And I like the double meaning, too: that as a critic I “hit” the man or woman who left themselves open to punishment when they betrayed their art. Badly educated in a one-room school, a father of one at sixteen, a laborer after high school, father of three when in graduate school, I love my later luck, my unlikely life as a university professor and writer of books. But now that I’m a pensioner I resist being a petitioner. Here is how old age comes up against the new age. Because editors of beleaguered book sections now try very hard to disseminate positive, happy talk, they ask reviewers to “pitch” themselves and books the reviewers think they will praise. Editors have taken over the diction of producers in the movie and TV business. To find a publisher for Passing Away, I will need to pitch my marketing plan—describe how I fit the press, the book’s audience, my social media presence, my contacts who can furnish blurbs. Publishers’ requirements for non-fiction projects have now migrated to art. I live in Brooklyn. I know it’s only fair that I compete with the young scrabbling writers here, but, as Prufrock says about his undelivered romantic pitch, “would it have been worth it after all”? When I was seventeen, I was peeling pulp in the Vermont woods. It was a harsh job I couldn’t refuse. With luck, I went from woodsman to wordsman, and now I feel like refusing to be a pitchman. Saying “no mas” would not “disturb the universe”; it would just be a gesture I might remember with pride as my wits desert me. Opting out of self-promotion might preserve a modicum of dignity and throw some silent shade on a publishing world that has devolved, I believe, since I published my first review in the Times in 1976, years before some of my editors were born. I don’t want to be frustrated and angry in my final years. If, as Hamm says, I decide to “speak no more about it . . . speak no more,” I’d still read, perhaps older books I’ve missed. I’d still write emails to my friends. But I’d write no more about books. And write no more books. Final words could also be the last words of an essay entitled “Final Words.” Moving toward this last paragraph, I realized Endgame doesn’t end when the lights come up. In the performances I’ve seen, the actors stay on stage while the audience exits. Hamm and Clov may want to end, but we’re aware that they will be performing the same roles on that stage, saying their last soliloquies the next night and the next, waiting for the close of the play’s run. Their continuation suggests a possibly happy non-ending for me. Words on the page have an attractive finality, but by writing these I have an odd sense of futurity. I could wait. That’s the one-word reminder that Kafka is said to have posted above his desk. The final word of Passing Away is borrowed from Updike, the last word of Rabbit at Rest: “Enough.” Depending on the tone, the word indicates one is satisfied or satiated. Maybe enough is not enough. Perhaps I’ve been identifying with the wrong Beckett play. There could be dignity, I thought, in waiting for a change or the end. Find the last poor Pret’rite one.